Caterpillars crawl over a leaf in Denpasar on the Indonesian island of Bali on Wednesday. Parts of Indonesia are under siege by swarms of hairy caterpillars, which are getting into homes and causing skin rashes, according to local news reports. “The caterpillars are very disturbing. They crawl into the house and make our skin itch for days. They have long hairs,” a Jakarta resident identified as Nurhayati told the Jakarta Globe. A caterpillar swarm was first reported in East Java two weeks ago, according to the Globe, and new swarms have been observed in Bekasi, West Java, and Buleleng, Bali. 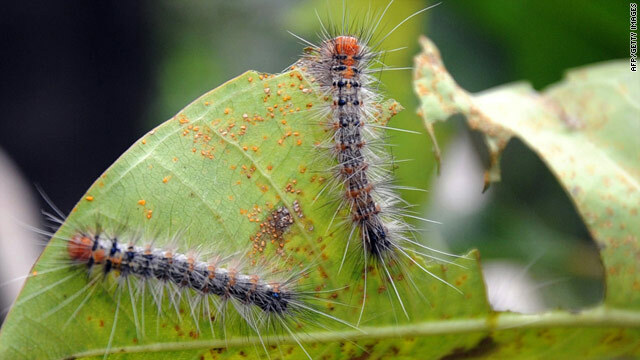 The caterpillars are targeting the leaves of mango trees in Bali, according to a Bali Times report. Bali agricultural chief Made Putra Suryawan said Wednesday that authorities there are spraying insecticide and burning garbage to stop the spread of the insects, according to an Agence France Presse report on kompas.com. Suryawan said the species of caterpillars had not yet been identified. Their elevated numbers could be caused by a lack of predators, he said in the AFP report. “There’s a reduction in the number of birds and ants that feed on these caterpillars. People catch the birds to sell them and catch the ants to feed their pet birds,” Suryawan is quoted as saying. One politician has his own theory about the caterpillar swarm, according to the Jakarta Globe: It's a warning from God. Introspect and make changes? Yes, starting with you, you Parliament of Trash! The same caterpillars have infested the area of Lake Jackson TX. I had one on my should last sunday and developed a rash on my shoulder, breasts and back. Very interesting! They will silently drop off the trees on you. They seem to be attracted to bright colorful flowery shirt. I don't touch 'em we brush them off with a card, paper, straw. You can paint your bottom half of the tree white or spray your trees. If not they will beback. Poor garden hygiene breeds them! They look like Gypsy moths the same ones that raveged the east cost oaks a few years ago. Nothing more or less. They will strip a tree completely when they are plentiful. Tree can take it one or two tmes before it dies. We came across these in fire camp and they caused a major rash and itching that would scratch the skin and spread the rash. When first found, we used a good antibacterial cleanser and the rash was gone in minutes. Its a sign from god that he likes to irritate the crap out of you. Also it's not hard for these caterpillar's to get in house in indonesia. They just kind a walk in to the huts and try to get a snuggling that is so deep. As mentioned by Sabda Palon in Darmagandhul manuscript that He will makes Islamic Kingdom in Indonesia become tremble and confuse and the sign of this Sabda Palon coming is start from Banyuwangi to Probolinggo (The first known caterpillars outbreak). The caterpillar represent a new wave that brings destruction but in other way it will bloom and become a butterfly. It means Indonesia will be change and this change will bring destruction to almost entire wordly way but after this it will bring joy and happiness to spirit joy as we smile when looking at butterfly, so beautiful, so peace, full of love of Father. The Kingdom coming soon, this is three sign, three wave. First wave is The Son of Man Enter Wordly World, The Second id The Son of Man Leave Wordly World, The third is The Son of Man coming back to save his children. This is my vision. I, who cursed by the world but bless it and wait for releasing by My Lord Christ Jesus. Amen. I wonder if you can fry them! They must contain some sort of protein. caterpillars ain't no match with taliban's breading and stone age law style in Aceh....soon will getting worse like in pakistan, afghanistan, saudi, egypt, somalia, bangladehs, iran, ....democracy ..kill.... free spech..kill...women.. wear burqa..if not..kill.. women stay at home.. no need education.. infidel ..kill ..etc.. etc ..